Summer is a fantastic time of year. No school, backyard barbeques, days at the beach or the pool with your family, flip flops and tank tops. What is not to love about summer? Well, those insect bites can really kill the mood on a great summer day. Bug repellants are great, but even the best repellants can’t guarantee you won’t be bitten by ants or some mosquitoes. So the next time you are faced with a dreadful bug bite, try one of these simple home remedies to help the itching and swelling subside quickly. The best part is that you most likely already have one or more of these treatments in your home right now. Experts agree that some of these alternatives can be just as effective at treating bug bites as any over-the-counter medicine. Some of these treatments may be more effective than you for others, since everyone’s body respond differently to different types of treatments. If you do not find any relief from one of these options, or you feel you are experiencing a life-threatening reaction to the insect bite, such as anaphylaxis, please contact your doctor or call 911 immediately. A single ice cube can constrict the blood vessels and decrease the body’s natural histamine release, which is what causes your skin to itch. You can use an actual ice cube, or if you have an ice pack, you can apply that for 10 to 15 minutes. Ice is one of the most recommended methods of relieving insect bites, simply, because it works. If you have ever taken aspirin, you probably know it for its pain relief and anti-inflammatory properties. The same properties apply here to help bring down the pain and swelling of an insect bite. If you already have aspirin in powder form available, like BC Powder or Goody’s, just grab one of those, if not simply crush up an aspirin tablet to make it a powder. Combine that powder with just a little bit of water until it makes a thick paste and apply that paste to the affected area(s). Leave it on for up to a few hours and wash it off. However, you may want to avoid aspirin for stings from a bee or wasp, as one study found it to be less effective for treatment of stings. Baking Soda can effectively relieve the itching caused by an insect bite, in fact, Mayo Clinic recommend baking soda for treatment of insect bites and stings. The science behind it deals with the pH of your body, the insect’s fluid secretions in the bite, and the baking soda. Since baking soda is alkaline in nature, it neutralizes the pH of the skin and provides relief from the insect bite. Simply make a paste of baking soda and either water or witch hazel and spread it on the affected area. This paste can be left on for 10 to 30 minutes then rinse off. While it may be a sticky, honey has great antibacterial properties. According to Dr. Oz, applying a bit of honey over a bug bite can help prevent infection and help soothe irritation. Just be sure to stay inside until you wash it off to avoid other insects being attracted to the sweet smell. Lemons and limes have great anti-microbial and anti-inflammatory properties. Dr. Mercola recommends using lemon and/or lime juice to treat bug bites. Simply cut your chosen fruit in half and rub over the itchy skin for quick relief. Be sure to do this one inside because citrus juice on your skin in the sun can cause sunburn and could possibly attract other insects. Toothpaste can bring great relief from an insect bite. Choose one that is not a gel, and a bonus for one that is a mint flavor with baking soda. Menthol and baking soda can minimize swelling and relieve the pain associated with the insect bite. Tea tree oil, also known as melaleuca essential oil, has amazing antibacterial properties and is great for cleaning your skin, among its laundry list of amazing uses. Applying a drop of tea tree oil to the area of the insect bite can reduce swelling and itchiness, and decrease the risk of infection. If you have sensitive skin you may want to also use a carrier oil such as coconut oil to dilute the oil or use lavender essential oil which has similar properties for calming the skin. This spice isn’t just limited to the kitchen. Basil leaves contain chemicals such as camphor, which creates a cool feeling, similar to menthol in toothpaste, and will help reduce swelling and itching of an insect bite. Crush a few leaves and apply the bits directly to your bumps. Just be sure to wash your basil well before using it, because basil can be a host to mites and other critters as well, which can cause another round of skin issues. Garlic is known for having antibacterial properties and for helping to fight a number of infections and illnesses. Garlic can help reduce swelling and soothe itching caused by mosquito bites. More so, the smell of garlic can also help to keep mosquitoes at bay. Simply apply some minced garlic to the effected area, leave it on for a minute or so, and rinse off. Leaving garlic on the skin for too long can bring negative effects of its own. 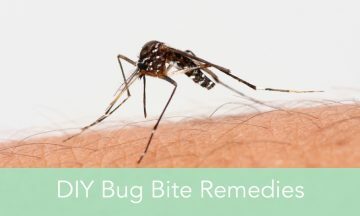 Do you have another great home remedy for bug bites? Share with us in a comment below.